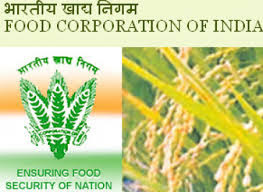 FCI recruitment 2019 has released for various roles. Here they announced for the vacancies 4103 JE, AG, Steno & Other Posts. Now check below all details. Degree in Civil Engineering or Diploma in Civil Engineering with one year experience. Degree in Electrical Engineering Or Mechanical Engineering or Diploma in Electrical Engineering Or Mechanical Engineering with one year experience in the case of Diploma holders only. Graduate along with O‘ level qualification of DOEACC and speed of 40 w.p.m. and 80 w.p.m. in typing and shorthand respectively or Degree in Computer Science/ Computer Application with speed of 40 w.p.m. and 80 w.p.m. in typing and shorthand respectively. A degree of a recognized University with Hindi as the main subject. One year experience of translation from English to Hindi and vice-versa. 30 W.P.M speed in Hindi Typing. Bachelor of Commerce from a recognized University with proficiency in the use of computers. B.Sc. in Agriculture from a recognized University. To apply Food Corporation of India job, the candidates required to attain following age limit. The notified aged candidates only can able to apply for the job vacancy. check the age limit details below. For more reference kindly check the FCI official notification 2019. Food Corporation of India (FCI) 4103 JE, AG, Steno & Other Job salary details has been given below. The candidates can check various salary information below. Step 2: Search for JE, AG, Steno & Other notification link in careers/ Advertisements/ News page. Step 4: Check and verify your eligibility to FCI Recruitment 2019. If you are not eligible for the job notification, ignore and leave space for others. Step 6: Create your registration on FCI and Fill all correct details.